A new Maesteg Market, Llynfi Power Station…….and a big hole. Two big projects in the Llynfi valley have been announced over the last couple of months. Firstly, a revamp of Maesteg Market. £2.5million has been earmarked for the project from the Welsh Government and EU funds. The planning application has been lodged with Bridgend Council this week. 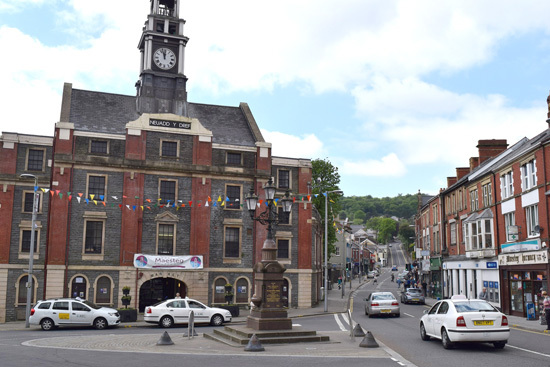 The scheme will involve the demolition of the existing outdoor market stalls, to be replaced with a new market square, performance space backing onto Maesteg’s council offices and new modern market stalls/shoplets powered by solar panels. It’s the latest stage of public realm regeneration in the town off the back of Commercial Street’s improvements over the last few years. Further down the valley, near Coytrahen, there’s a proposed 25MW biomass power plant at the site of the old (coal powered) Llynfi power station. Planning permission was granted for a 10MW plant in 2009, but the amended proposal by Morgan Credit Energy is for a larger 25MW biomass plant. The environment credentials were submitted at the end of 2010 and a full planning application submitted in January, awaiting approval. The Environment Agency, however, asked that the application be deferred – not because of air quality issues but because of flood consequences which need to be ironed out. The plant would burn wood chips – initially delivered by road – but with short/medium-term ambitions of a rail delivery system at the site (possibly part of Network Rail upgrades for a half-hourly passenger service to/from Maesteg). The non-technical appendix says that wood chips would be transported from Newport, which hints at imported wood chips. This might not be necessary. Land Energy, based at Brynmenyn (about 2 miles from the site) is one of Wales’ leading suppliers of wood chip pellets for smaller domestic and industrial heaters. Wouldn’t it be great if a local company like Land Energy could expand to supply the new power station (in part)? Then there’s the not so good. The old Budelpack plant at Ewenny Road. I’m not sure if it was supposed to be some kind of artistic statement about the decline of industry in south Wales, but there have been several pictures in the local press over recent months of massive piles of rubble. Not living in Maesteg I’m not sure if the site has been properly cleared since. 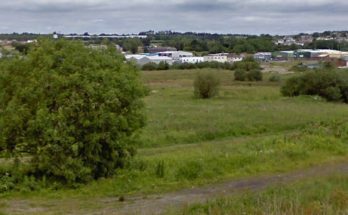 There’s a real need to develop this site properly, perhaps a mixed-use development of affordable housing, a bigger presence for Bridgend College in the Llynfi valley, business starter units and landscaped open space. The days of expecting one massive factory to be immediately replaced by another one off the back off big grants are long over. There are parts of “The Works” regeneration scheme in Ebbw Vale for example that might be applicable to the Ewenny Road “hole”.